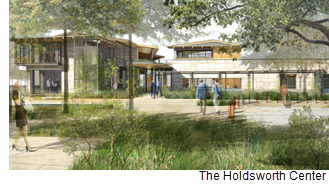 ​​​ LAKE AUSTIN – Members of the Holdsworth Center broke ground on a $150 million campus that will be the home of a leadership training institute. The 44-acre campus at 4907 RM 2222 will include 16 buildings, a 180-room residential village, a 300-person event room, interactive classrooms, and seminar spaces. The facility will serve public school district superintendents and other school leaders throughout Texas.